Accurate sizing charts are located at the bottom of all product pages. We do not make custom race suits. The form below is to help us select your best suit size from our inventory. You don't have to fill out everything, just give us as much information as possible. 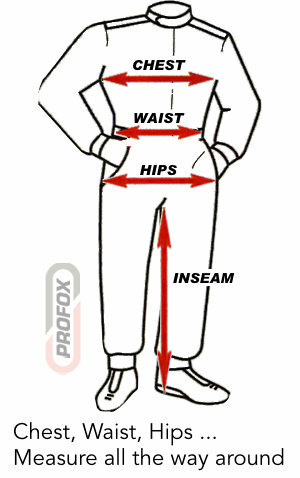 Suit sizing chart form requests are processed by a PROFOX Racing associate and are not automated. We try to respond to all sizing requests the same day. Sizing charts are located at the bottom of all product pages.This information will not be shared with any third party.